April is the month that gives back, offering up a FOUR day wonderfully precious long weekend. It’s time to put a spring in your step and make the most of the late nights and extra lay-ins. And who better to guide you through making the best of your time than with a step-by-step Bourne & Hollingsworth guide. Step one on your journey to Easter Weekend fulfilment is Thursday night celebratory cocktails, titillating talk and good times. Reverend JW Simpson offers all three. Shrug of the capricious climate and start the festivities with a sneak peek at our brand new cocktail menu and let the Reverend and his team lovingly open the door to Thursday night frolics and foolery. That’s right, you heard us. Brunch at B&H Buildings and B&H Garden Room from Good Friday to Easter Monday. Sink into an armchair, install yourself at B&H Buildings or B&H Garden Room and let us do the work. 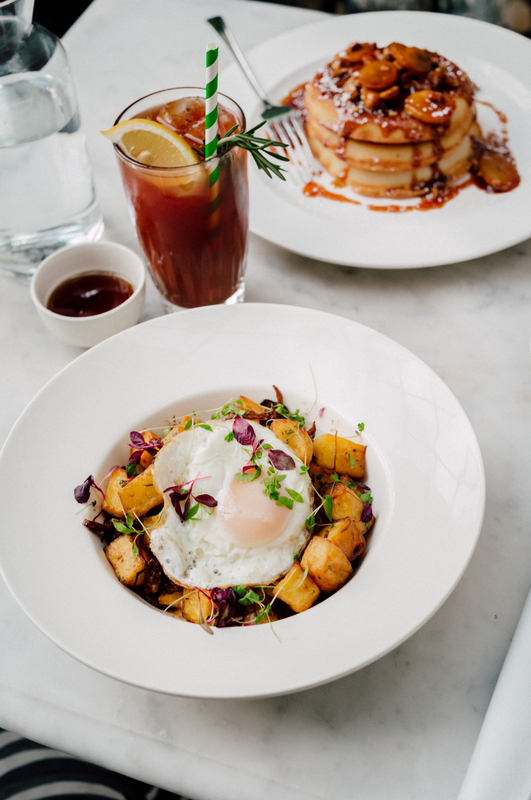 After feeling suitably warmed up with a few bloody marys, head home for a shower, reset and perhaps a nap (it is Easter weekend after all) before making your way to Bourne & Hollingsworth Bar. Hidden beneath the streets of Fitzrovia, tonight is the night for good time drinks and dancing ‘till dawn at our original basement party bar. After feeling revived with a lie-in, saturday papers and a strong pot of coffee, head back to Clerkenwell where you and your friends have decided to book a rather glamorous private dining room (one of three) at B&H Buildings. Indulge in a hearty banquet, and catch up over a glass of wine. For those who feel inclined, Below & Hidden, the secret clubroom nestled beneath B&H Buildings will be open for late-night drinking and dancing until 2am. Three nights partying on the trot and now is the time to go into recovery mode. You need ibuprofen and a bath - that part you’ll need to do yourself - and then you need to make your way to B&H Garden Room where we’ll do the rest for you. Wake up your taste-buds with one of our Garden Bloody Marys, choosing your own juice, spirit and spice, load up on protein (eggs in a myriad of delicious combinations), bolster your vitamin D intake at our sunny rooftop venue, sit back, relax and gain some perspective on last night’s high jinx as you bask in the sunny surroundings of B&H Garden Room. For those who pursue the Sunday cocktails a little too vigorously, please repeat the brunch step again on Monday at either B&H Garden Room or B&H Buildings. The rest of you, it’s meant to be sunny, so reel in the extra day and go for a languorous walk in one of the many beautiful parks our fair city has to offer.